India’s election and Pakistan’s economic crisis are coming at a bad time. While India and Pakistan seem to have stopped bombing one another, the causes behind the cross-border tensions aren’t going away any time soon. The two nations are nuclear-armed; have large conventional armed forces; have had four serious wars since they became independent in 1947; and have enormous cultural and religious antipathy. This is a prescription for a disaster, and yet the confrontation is flying below the international radar – well below North Korea, Brexit, China-U.S. trade confrontations, Iran and even the “yellow vests” of France. A full-blown war in the valleys and mountains of Kashmir is a very real possibility. When I was the supreme allied commander of NATO, the most important mission of the alliance was dealing with terrorism in Afghanistan. Unfortunately, our Pakistani partners continued to support many of the radical elements of the Taliban. They were afraid of creeping Indian influence, and much preferred a Taliban-dominated Afghanistan to a more Western-leaning and independent Afghani government. I dealt often with General Ashfaq Kayani, the lean, chain-smoking chief of staff of the Pakistani army (arguably a more powerful position than the prime minister). He frequently came to NATO’s political headquarters in Brussels to brief the combined military leadership of the alliance on the key threat Pakistan faced several years ago – internal terrorism. Yet always hovering over our conversations was the Pakistani military’s deepest concern: India. The most recent crisis was set off in mid-February when a Pakistani terrorist group, Jaish-e-Mohammed, detonated a suicide bomb in Indian-controlled Kashmir, killing 40 Indian paramilitary soldiers. It was the deadliest attack on security forces since that insurgency began in earnest decades ago. While the Pakistani government denied involvement in the bombing, India believes it was aware of the incident, and therefore responded with significant airstrikes into Pakistan. Two Indian fighter jets were shot down and a pilot captured. There was an unmistakable echo of the 1947 and 1965 Kashmir conflicts, in which tens of thousands died. Most worrisome, of course, are the significant nuclear arsenals of the combatants. Each has roughly 150 missiles, although only India has a submarine-based ballistic missile capability and thus a true nuclear triad (land, air and sea). Pakistan is developing sea-launched cruise missiles to counter that Indian threat. India has adopted a “no first use” doctrine, although Pakistan – which has smaller conventional forces and thus potentially the need for a more ambiguous doctrine – has not made an equivalent pledge. Paradoxically, the fact that both sides want to avoid a nuclear conflict has probably prevented an escalation on the conventional side during recent crises. In past conflicts, the U.S. has played a mediating role. But today Pakistan is more inclined to work with China. India has strong relations with both the U.S. and Russia, but is unlikely to turn to either, so as not to appear beholden to any peer “great state.” This tracks with the tendency of the Trump administration to let nations work things out themselves. Other than National Security Advisor John Bolton’s sensible comment that the U.S. supports India’s right to self-defense, the administration is staying on the sidelines. Complicating the picture is that the Washington is trying to enlist Pakistani aid in ending the long war in Afghanistan by reining in the Taliban. What the U.S. can do most effectively is to quietly encourage both sides to step back from escalation – which Pakistani Prime Minister Imran Khan did by releasing the captured Indian jet pilot unharmed. We should also offer our intelligence capabilities to both India and Pakistan as each of them deal with the disruptive terrorist groups operating from Pakistani soil – Jaish-e-Mohammed and the even more deadly Lashkar-e-Taiba. The U.S. could also encourage other mediation by allies and international organizations, in particular Saudi Arabia, which reportedly was influential in the release of the Indian pilot. As Hussein Haqqani, a former Pakistani ambassador to the U.S., recently pointed out, Pakistan in on the verge of an economic crisis. While the Khan government has tried to defuse the situation, in part by appealing to the International Monetary fund, internal pressures are building. Make no mistake: With Pakistan’s economic plight and the upcoming elections in India, South Asia is in a situation in which a military miscalculation, perhaps even a nuclear one, is real possibility. Disasters can happen anywhere and at any time. But some places experience more than their fair share of floods, tornadoes, hurricanes, winter storms and severe weather — so much so that certain locales earn frightening nicknames, such as Tornado Alley. No matter where you live, make sure you have the right kinds and necessary amounts of insurance coverage to protect your finances. New Jersey earns the top spot on this list, in large part due to damage wrought by Sandy — which had weakened from a hurricane to a post-tropical cyclone by the time it the Jersey Shore — in October 2012. The state was among the hardest hit by Sandy, which was the second-costliest storm in U.S. history, after Hurricane Katrina. Many homes and businesses were destroyed along the Jersey Shore, and a portion of the Atlantic City Boardwalk washed away. Shortly after Sandy hit, another storm brought wet snow that caused more power outages and damage. Homeowners who live along the coast or in areas where there are frequent storms should take steps before hurricane season begins to protect their homes and finances from damage. Palestinian terrorists in the Gaza Strip fired a mortar shell at the Eshkol region of southern Israel on Saturday night, amid an uptick in violence along the Gaza border. The mortar shell struck an open field, causing neither injuries nor damage, the local government said. The launch triggered air raid sirens in the region, sending thousands of residents to bomb shelters. “Residents of the Gaza periphery have been living under a continuous state of emergency for many months. If the children of the Gaza periphery aren’t sleeping at night because of the situation, it must also wake the policy-makers and those responsible for the security of the citizens of the State of Israel,” Eshkol Mayor Gadi Yarkoni said in a statement. Earlier in the day, police sappers were called to the Israel-Gaza border area after a cluster of balloons suspected of carrying an explosive device landed in Israeli territory. From images of the device, the balloons appeared to be carrying the warhead of an anti-tank missile. The balloon-borne device was located in the Sdot Negev Regional Council. Police instructed hikers to keep away from the area as they carried out a controlled explosion. A screenshot from a Channel 13 report on March 9, 2019 showing a police officer at the spot where a controlled explosion of a cluster of balloons carrying a missile warhead took place. On Friday, a mortar shell from Gaza struck an open field in the Eshkol region, causing no injuries or damage. In response, the Israel Air Force carried out several strikes in the Strip, hitting a Hamas military base in the south of the territory and underground infrastructure in the north. Friday also saw thousands of Palestinians take part in violent protests along the border, and two men, whom the IDF said were carrying a knife and a hand grenade, were arrested after crossing into Israel from the northern Strip. 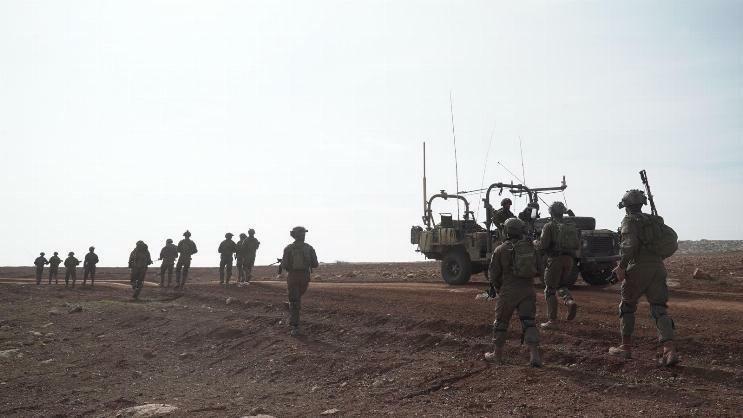 The two infiltrators broke through the security fence and evaded capture for approximately half an hour, forcing the IDF to bring additional troops to the area, as well as local communities to go on high alert and call up their volunteer security forces. In light of the increasing violence between Israel and Hamas, Egypt and other mediators have been working intensively in recent weeks to broker a cease fire agreement between the two sides, but thus far to no avail. Friday’s protests were part of what Palestinians call the “March of Return,” a series of regular demonstrations and violent riots along the border fence that have been held since March 30, 2018. The flying of kites and balloons carrying burning objects and explosives had been a main element of the weekly clashes on the Gaza border, ravaging forests and farmland in southern Israel and posing a threat to local residents. On Thursday, Prime Minister Benjamin Netanyahu warned Hamas that Israel would respond harshly to any further violence emanating from the Strip. Egyptian mediators were in Gaza this week as Cairo launched a new round of mediation between Israel and Hamas in a bid to secure a lasting ceasefire deal. At least 42 Palestinians were wounded by Israeli sniper fire in renewed protests along the Gaza-Israel border Friday, the enclave’s health ministry said. A statement from the ministry’s spokesman said 42 people „were shot by Israeli occupation forces“ during the 50th week of often-violent demonstrations. Four medics were among those wounded, the ministry said. An Israeli army spokesman said „approximately 8,400 demonstrators and rioters are currently gathered in a number of locations along the Gaza Strip security fence“. „They have hurled explosive devices and rocks at the security fence and soldiers, and have also ignited tyres,“ the spokesman said. Troops responded according to „standard operating procedures“, he added. Israel accuses Gaza’s Islamist rulers Hamas of using the protests as cover for infiltrations and attacks, while rights groups and Palestinians say protesters posing little threat have been shot by Israeli snipers. At least 252 Palestinians have been killed by Israeli fire since March 2018, the majority shot during weekly border protests and others hit by tank fire or air strikes in response to violence from Gaza.